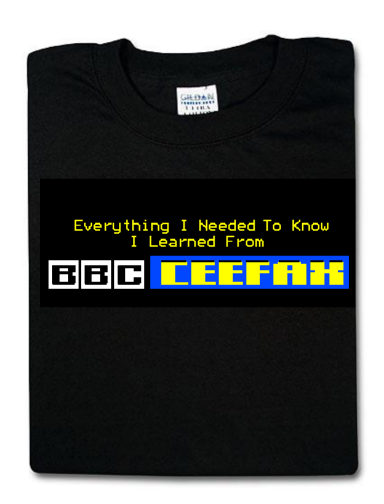 Are you nerdy enough to wear this shirt? Just made this up in an idle moment. 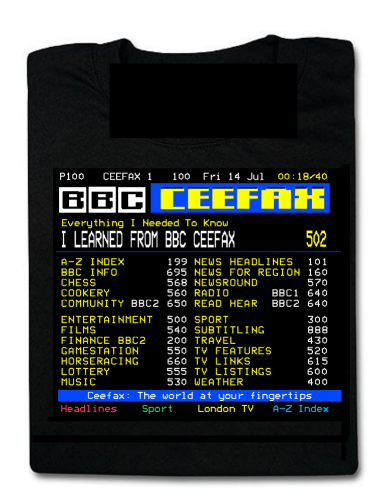 On the back, it's a loving, faithful and nearly pixel-perfect reproduction of the BBC 1 analogue terrestrial teletext main page, except the headline with the cool double-height font has been changed to our "Everything I need to know" catchphrase. Let me know. Email: phil [at] pjc.me.uk. Replace [at] with @ to email.